Shortly after my first child was born I encountered a few crises in my life. Those little challenges drove me to a book I found in my mom's bedroom called Lord, I Want to Know You. It was a short Bible study written by Kay Arthur. Hungry for something to establish my shaken life upon, I hungrily devoured that Bible study book. It was probably the first time I had ever used a guide to take me through the Scriptures in search of concrete answers to life's problems. From that precious study I discovered my God's true character and ways. Before, I had constructed in my mind a God of whom I had heard and a God who fit my bill, so to speak. But as that little Bible study guide led me through the scriptures, I discovered how big and powerful and loving and sufficient and gracious my God really is. That Bible study changed my life. And that little paperback Bible study gave me an insatiable hunger for more of the Bible. When I turned to the last page of the book, I read a little note to the readers. It simply said something like, "If you're interested in learning more about how to study the Bible, call ###-###-####." (That was well before the days of websites!) So, still reeling from all that I had learned and dizzy with the anticipation of learning more, I immediately dialed the number on the page. The book, still on my bookshelf today, indicates that I jotted down the dates and costs of a Precept Training Seminar that was to be held about an hour from my parents' house the next month. I went to my parents' home, left my 4-month old nursing son with some bottles in the care of my dad each day, and drove the hour-long commute to the training classes for three days. And there I learned how I, a seminary drop-out who had never really even studied the Bible very much, could not only study the Bible, but teach Bible study classes to others. Oh. My. Word. The Bible is God's Word. God's Word. Straight from His loving and holy heart to ours. His Word on every subject life will ever present. His Word for our day. His daily bread meant to feed our hungry souls. Do you read the Bible? Better yet, do you read it for answers? Do you search it through and dig in it and pose your questions to it and expect answers and pray through it and spend time in it? Do you long to know what it has to say to you...today? You will never waste a moment spent studying God's precious Word, especially if you take the time to learn some good Bible study tools and techniques. 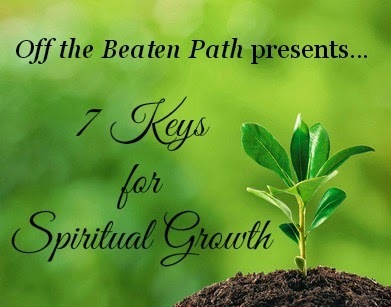 if you want to grow spiritually. But, in a Bible study group you will also find support, friendship, encouragement, instruction, accountability, prayer support, and godly guidance. You will have greater opportunity to study the Word of God responsibly and consistently when you surround yourself with other eager students and position yourself under sound and biblical teaching. where you have to actually open your Bible and look for answers to meaningful and appropriate questions. Have you been considering studying the Bible? Here's a great resource for finding a study. And I'd also like to suggest that you give one of mine a try as well. But better yet, call around to churches in your area and find a study group to join. You'll not regret it! How has studying the Bible changed your life? What is a favorite Bible study of yours? Do tell!